NALFLEET™ AUTOTREAT™ is a multifunctional, liquid boiler water treatment, formulated with alkaline compounds, scale inhibitor, dispersant, and volatile amines for the protection of the feed, boiler and condensate systems. Autotreat combines well-known phosphate treatment with new polymer technology. This ensures that precipitates are kept soft and non-adherent for easy removal by blowdown. Avoid aluminium, zinc and galvanised steel. NALFLEET™ Autotreat is a boiler water conditioner designed for optimum protection of ships boiler systems when used in conjunction with an oxygen scavenger. The product combines well known phosphate treatment with new polymer technology. This ensures that precipitates are kept soft and nonadherent for easy removal by blowdown. The product should always be used in conjunction with an oxygen scavenger, preferably NALFLEET™ Oxygen Scavenger Plus. 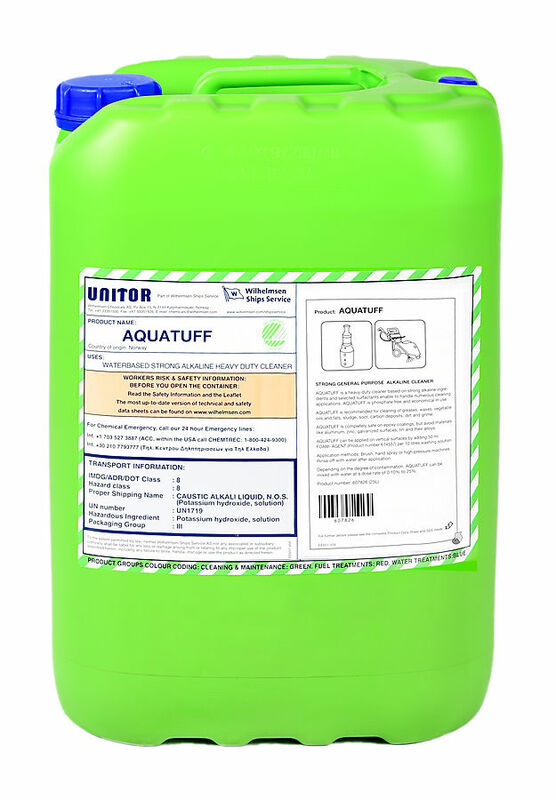 Note that this product is formulated for use in conjunction with good quality feed water. The product should preferably be dosed continuously with an automatic dosing unit. Alternatively the product can be fed into the feed line by means of a by-pass pot feeder. Initial fill dosage is 2.4 litres of NALFLEET™ Autotreat/ton of boiler capacity to reach a P-Alkalinity level of approx. 200 ppm. For an untreated system it is recommended to initially bring the treatment up to a suitable level of 200 ppm p-Alkalinity. The dosage chart given below is for convenience to determine the amount of product required to elevate P-Alkalinity. Note that the table is based on reaching 200 ppm. These are recommended values based on experience, and are in no way intended to replace the boiler manufacturers specifications, or company regulations. Typical control limits are: * P-Alkalinity: 150-300 ppm as CaCO3. * Chlorides: 200 ppm Cl max. * Condensate pH 8.3-9.0. Excessive Chlorides are removed by blowdown. It is important that regular testing is carried out to ensure that treatment levels are correct.